Last year I shared the reasons behind why your child may come home in the afternoons with The After School Attitude! Today I have Sarah from How Wee Learn here to share her perspective on this phenomenon as well as five ways you can improve your child's after school behavior once they step off the bus! Sarah is a teacher and Mama to 3 wild ones. She write over at www.HowWeeLearn.com where she shares out of the box learning ideas, natural living posts, and wanna-be homesteader stories. She would love for you to visit! When I was teaching Kindergarten I remember so vividly chatting with parents about the concern of the after school attitude. What was going on? Why on earth is my child so upset and cranky once he gets home? Is he like that at school? Is there a problem going on I should know about? These concerns are very real. But quite usually the cause is simple enough to fix. When I read Devany's post about the After School Attitude, I realized I didn't have to write about it myself! I think she hit the nail on the head. Instead I thought I would add to that brilliant post. 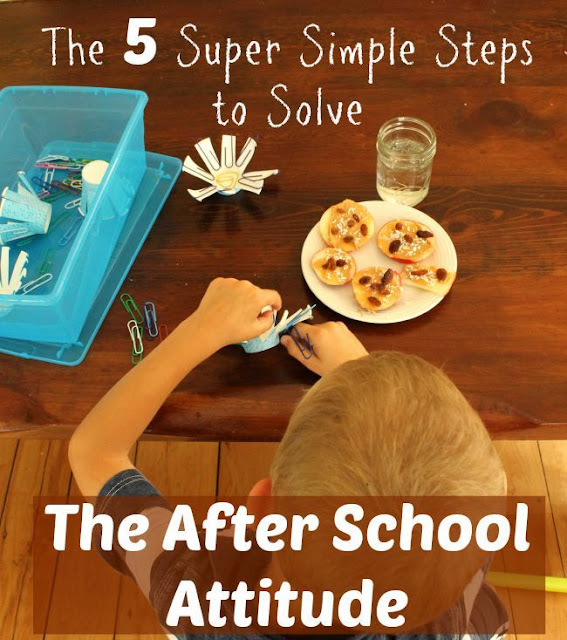 Specifically about what to do to FIX that after school attitude. So little ones, I truly believe, are simply adjusting to school. Adjusting to the new routine, the new rules, the limited freedom, and the bigger expectations. 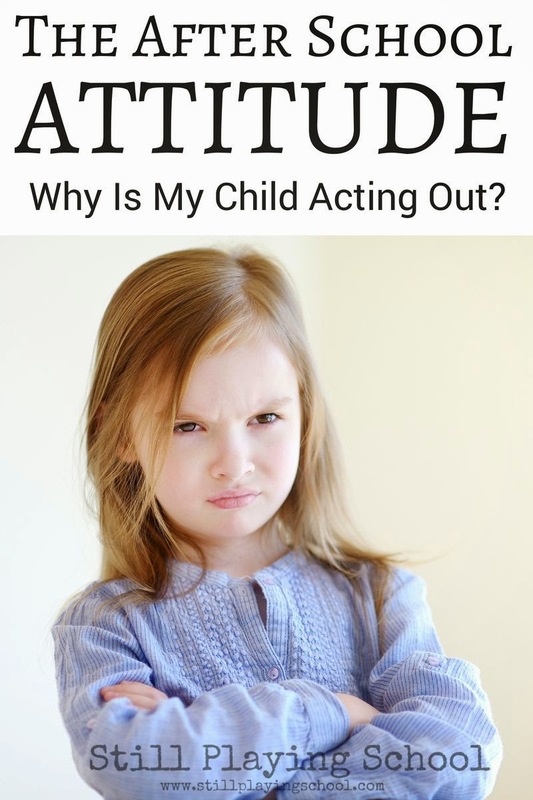 So how can you help your little ones while they are dealing with this adjustment? With 5 Simple Steps. 1. Make sure your little ones are getting enough sleep. It is recommended that children of kindergarten age get ten to twelve hours of sleep each night. 5. and a gently structured, open ended activity and sit or work close by, but let them transition and unwind on their own. 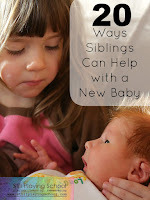 Let them now that you are there to chat and visit and hug and snuggle whenever they are ready. This will ensure two things. First of all, that all of their basic needs have been met. Second, that they can engage and focus on a gently structured activity which allows them to begin to process their day. When little ones are focused on an engaging activity it allows them to rest and think. They can process their day and will begin thinking about some awesome things to tell you ... and maybe some things that weren't as awesome too. Television doesn't do this for kids ... but Quiet Bins do. I have used quiet bins in this manner for years with my daughter. And I have recommended them to countless parents. 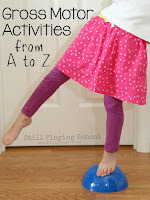 They are super simple to set up, incredibly inexpensive, can be used again and again, and will allow little ones to quietly engage and gently process. That is why I wrote my book and eBook A Year of Educational Quiet Bins. The crankies and melt downs will be behind you, as well those bedtime chats when you think, 'why didn't you tell me about this sooner?!'. Give this gentle after school rhythm a try - you will be amazed. If you are looking for Quiet Bin ideas I have the FULL year planned for you in either eBook or Print Book form! Enter the code "BacktoSchool" to save $2 on the eBook! I've been surprised by how well quiet sensory bins worked to help my daughter calm down after school. I tried it one day on a whim and it was almost magical! lol! It IS magical Emma! So glad you found something that works for your daughter - quiet bins are great for so many little ones. What a great whim it was! Well done Mama!